A United Launch Alliance Delta IV has launched with the fifth Wideband Global SATCOM satellite on Friday night, following a 24 hour delay caused by an issue associated with a ground support system helium pressurization line. Liftoff from Space Launch Complex 37B at the Cape Canaveral Air Force occured at 20:27 local time. 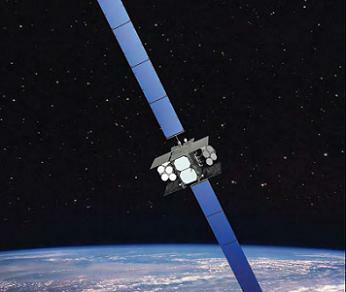 The Wideband Global SATCOM (WGS) was originally introduced as an interim system to augment and replace the aging Defense Satellite Communications System (DSCS), before being replaced by Advanced Wideband SATCOM (AWS) satellites. AWS, also known as the Transformational Satellite Communications System, or TSAT, was cancelled in 2009 in favor of WGS and AEHF. WGS was originally named the Wideband Gapfiller Satellite program, its name being changed after AWS was cancelled to reflect the fact that it was no longer an interim programer. The first WGS satellite, USA-195, was launched on 11 October 2007. It was followed by USA-204, or WGS-2, on 4 April 2009 and USA-211, or WGS-3, on 6 December 2009, these three Block I satellites completing the three-satellite constellation which had originally been planned. Two additional satellites were ordered in November 2006, exercising two of three options which had been taken out the previous month. The first of these spacecraft, WGS-4 or USA-233, was launched on 20 January 2012; the second, WGS-5, is the payload of Friday’s launch. Additional orders placed since 2006 will see the constellation eventually grow to at least ten satellites. From the fourth satellite onwards, Block II spacecraft have been used. These satellites differ from the first three in that they are equipped with RF Bypass equipment, which provides for the higher bandwidth required for Unmanned Aerial Vehicles. Further upgrades will be introduced from the eighth satellite onwards. WGS spacecraft operate in geostationary orbit; USA-195 is stationed over the Pacific Ocean, at a longitude of 174.8 degrees east, USA-204 is at 60 degrees east over the Indian Ocean, USA-211 is over the Atlantic at 12 degrees west and USA-233 is at 88.5 degrees East, again over the Indian Ocean. Around ten DSCS satellites also remain in geosynchronous orbit. Like other WGS satellites, WGS-5 was constructed by Boeing, and is based on the BSS-702HP satellite bus. It has a mass of 6,000 kilograms (13,200 lb), and a design life of 14 years. It carries X and Ka-band transponders operating at frequencies in the region of 500 and 1000 megahertz respectively. Power is provided by two solar arrays generating at least 11 kilowatts. The spacecraft’s propulsion system consists of an R-4D liquid-fuelled bipropellant apogee motor, with four XIPS-25 ion engines to trim excess eccentricity and perform station keeping maneuvers. 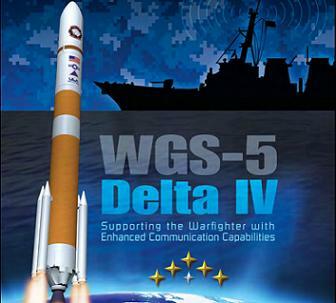 WGS-5 was launched by Delta 362, a Delta IV rocket flying in the Medium+(5,4) configuration. The twenty-second Delta IV to fly, Delta 362 is the third to use the M+(5,4) configuration, which was previously used for the launches of WGS-3 and WGS-4. WGS-1 and 2 both launched on Atlas V 421 vehicles. The first stage of the Delta IV is a Common Booster Core (CCB), which is powered by a single RS-68 engine. 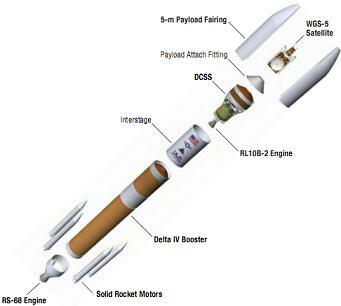 The second stage is a Delta Cryogenic Second Stage (DCSS), propelled by an RL10B-2 engine. Both burn cryogenic propellants; liquid hydrogen oxidized by liquid oxygen. DCSS stages with diameters of four or five meters can be used, depending on payload requirements; In the Medium+(5,4) configuration, a five-meter diameter stage will be used. Another feature of the Medium+(5,4) configuration is the use of four GEM-60 solid rocket motors to augment the first stage at liftoff. Each generates up to 1,200 kilo-newtons of thrust and burns for a little over 90 seconds. Two of the GEM-60s have fixed nozzles, while the other two have movable nozzles to provide attitude control through thrust vectoring. 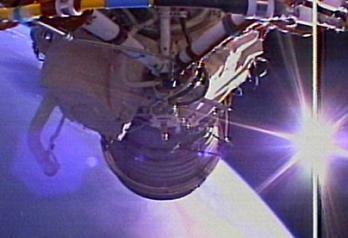 Ignition of the RS-68 engine occurred five and a half seconds before the countdown reached zero. Two hundredths of a second before T-0, the GEM-60 motors was lit, with liftoff occurring at T-0 when the rocket’s thrust exceeded its weight. A series of pitch, yaw and roll maneuvers commenced seven seconds after liftoff, orienting Delta 362 for its ascent towards orbit. It flew southeast, along an azimuth of 100.97 degrees. At 50.1 seconds after liftoff, Delta 362 passed through the area of maximum dynamic pressure, or Max-Q. The fixed-nozzle SRMs burnt out 91.2 seconds after liftoff, followed 2.2 seconds later by the thrust-vectorable solids. The two pairs of spent motors separated from the first stage at T+100.0 and 102.4 seconds respectively. Following separation of the solid rocket motors, the next major event in the flight was the separation of the payload fairing, which occurred three minutes and 27.5 seconds after liftoff. Main Engine Cutoff, or MECO, occurred four minutes and 7.4 seconds into the launch. The Common Booster Core’s RS-68 engine, having exhausted its supply of propellant, was then shut down ahead of stage separation. Staging followed 7.1 seconds after MECO. 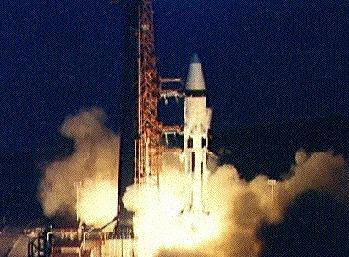 Thirteen seconds after the CBC was jettisoned, the RL-10 engine of the DCSS ignited to begin the first of two burns which will carry WGS-5 into a supersynchronous transfer orbit. This burn lasted sixteen minutes and 12.9 seconds. Following the end of the first burn, an event designated Second stage Engine Cutoff 1 (SECO 1), the mission entered a coast phase lasting seven minutes and 49.6 seconds. The RL-10 then restarted for a second burn, lasting for three minutes and 7.5 seconds, which will complete powered flight. Nine minutes and seven seconds after the end of the second burn, the DCSS reoriented to separation attitude, WGS-5 was deployed into orbit. From liftoff to spacecraft separation, the mission lasted forty minutes and 38.5 seconds. 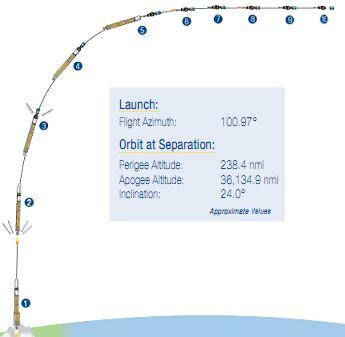 The target orbit for spacecraft separation is an apogee of 66,922 kilometers (36,135 nautical miles, 41,583 statute miles), a perigee of 441.5 kilometers (238.4 nautical miles, 274.4 statute miles), and an inclination to the equator of 24 degrees. From here, the satellite will under its own power into geostationary orbit. Delta 362 launched from Space Launch Complex 37B at the Cape Canaveral Air Force Station in Florida. Constructed in the 1960s to support the Apollo program, Launch Complex 37 originally consisted of two launch pads; LC-37A and B; however LC-37A was never used for a launch. The first launch from LC-37B occurred on 29 January 1964, when a Saturn I orbited the nosecone of a Jupiter missile, in a launch which first demonstrated the Saturn rocket’s ability to place a payload into orbit. Five more Saturn I rockets launched from the pad, all carrying boilerplate Apollo spacecraft, with three also deploying Pegasus micrometeoroid detection satellites. Two Saturn IB rockets also flew from LC-37B; the first was AS-203 in July 1966 carrying no payload, while the second was AS-204 with Apollo 5, the first test flight of the Lunar Module. Following the 22 January 1968 launch of Apollo 5, the complex was mothballed. While it was expected that launches from the complex would resume once the Apollo lunar program gave way to a series of planned Earth-orbit missions utilizing hardware developed for the lunar program – termed the Apollo Applications Program – LC-37 was not used for any further Saturn launches. When the Apollo program was terminated and future missions using the Space Shuttle planned, Apollo Applications was downsized; only the “S-IVB Dry Workshop” space station proposal, renamed Skylab, survived, and as a cost-saving exercise Kennedy Space Center’s Launch Complex 39 was modified to accommodate the Saturn IB rather than reactivating one of Cape Canaveral’s inactive Saturn I pads. Following its demolition in the 1970s, LC-37 remained inactive for the remainder of the twentieth century, however in the late 1990s, work began to rebuilt pad B, then redesignated Space Launch Complex 37B, to accommodate the Delta IV. 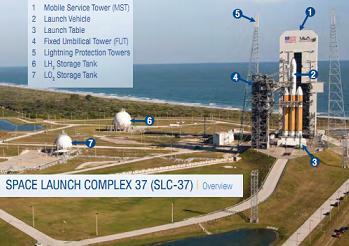 Friday’s launch was the eighteenth Delta IV launch from the pad, and the twenty-sixth launch from SLC-37 altogether. The launch was the first Delta IV launch of 2013, having been delayed while an anomaly during the previous launch; that of GPS IIF-3 last November, was investigated. During that launch, a fuel leak in the RL10 combustion chamber resulted in the engine delivering less thrust than had been expected. Due to the comparatively low mass of the payload – a GPS satellite which had originally been slated to fly on a Delta IV Medium, but which was upgraded to a Medium+(4,2) when it became slightly too heavy for the Medium – the rocket was able to correct for the under-performance by burning the engine for longer than had been planned. As a result, the satellite was still delivered successfully into the correct orbit. The only failure of a Delta IV to date came on the maiden flight of the Delta IV Heavy in December 2004, when cavitation in CBC oxidizer lines led to all three of the vehicle’s Common Booster Cores shutting down earlier than planned. This left the vehicle unable to place its inert demonstration payload, HLV-OLDSP, into the targeted orbit. Two secondary payloads, 3CS nanosatellites named Ralphie and Sparkie, which were supposed to have been deployed into the first parking orbit, failed to achieve orbit altogether. The last major RL10 problem occurred during the June 2007 launch of an Atlas V 401, carrying NROL-30 – a pair of NOSS ocean reconnaissance satellites for the US National Reconnaissance Office. In that incident, a fuel leak caused by a faulty valve resulted in the payload being deployed into a lower-than-planned orbit. Although this was the first Delta IV launch of the year, it was the fifth for United Launch Alliance, who have already conducted four missions using the Atlas V – most recently deploying a GPS satellite via an Atlas V 401 earlier this month. ULA’s next scheduled launch is of MUOS-2, another communications satellite for the US military, which is expected to depart from Cape Canaveral on 19 July. The next scheduled launch for the Delta IV is a repeat of Friday’s launch on 8 August, carrying the sixth WGS satellite. Two further Delta IV launches are planned this year: on 28 August a Delta IV Heavy will launch from Vandenberg Air Force Base with NROL-65 – a classified payload widely believed to be the last KH-11 electro-optical reconnaissance satellite – and a launch slated for 1 October will deploy the fifth Block IIF GPS satellite. In addition to the MUOS launch, another three Atlas launches are also scheduled to have occurred by the end of the year. Friday’s launch was the twenty-sixth orbital launch attempt of the year, including the suspected Iranian launch failure on 17 February. It was the seventh American launch of the year. (Images via ULA, PWR and NASA).